This weekend, I experienced what I can only describe as the culinary equivalent of that desire – when you’re about five years out of college – to go back to your college town with your old friends, hit all your old haunts and pretend you’re 21 again. You have a great time, but you end the weekend exhausted and wondering how you ever did that three nights a week. And, yet, you’re glad you went back and wonder when you’ll do it again. Before we had The Lad and Lass to entertain us, Husband and I would plan entire weekends and elaborate dinner parties around a “project recipe” I had come across. The French Laundry cookbook was not just a coffee table book in our house – it was a source document. We had some bang-up meals, but there were a few projects that resulted in a resounding “Eh.” Back then, having done it was worth even lackluster results; these days, I mostly look for recipes that taste like they took more work than they actually did. 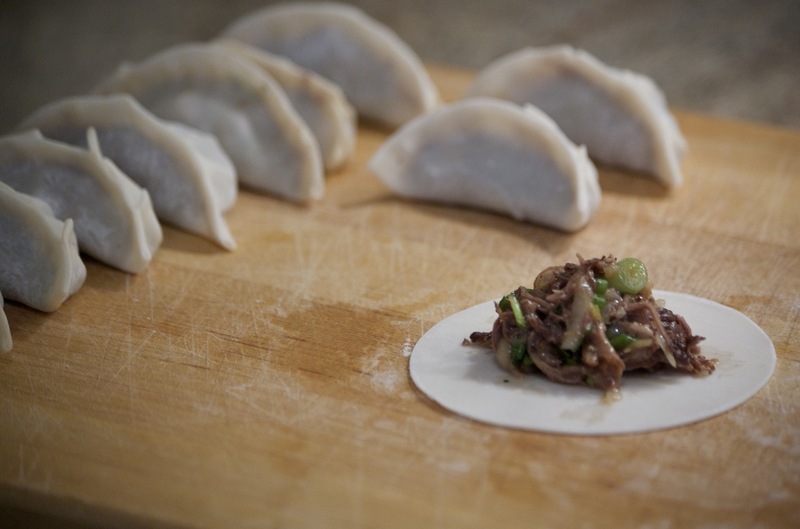 And, yet, every so often … I just need to dive into something that sounds just a little bit “involved.” And that is what happened when I saw Daniel Boulud’s recipe for Braised Short Rib Dumplings in the New York Times. I had short ribs on hand, thanks to a sale at Whole Foods a few days earlier, and was off to the races. I took bits of Boulud’s short ribs recipe and bits of Cooks’ Country‘s slow-cooker short ribs recipe and cobbled together a sweet-savory slow-cooker version. I don’t know if I’d serve it over mashed potatoes, but it was perfect for the dumplings. On Saturday, I tracked down the rest of the ingredients and made the dumplings themselves. Once the short ribs are braised, you simply shred the meat and toss it with the rest of the ingredients. Then, you fill the dumplings – something I had never done before. It took a few to get the sense of what the right amount of filling was right (and no one’s granny would be impressed with my pleats), but it only took me about 45 minutes to fill 30 of them. Once they’re filled, you can freeze the dumplings or cook them off. I froze half of mine and cooked the rest the way I cook my Trader Joe’s gyoza – put them in a pan with some oil, brown the bottoms, and then add water and steam the whole lot for about 10 minutes. The end result was worth the work, both because they really were very tasty (four of us demolished 30 of them in short order), and because I now have 30 in my freezer that I can pull out and cook in 15 minutes or less. And – despite the length of this post and the recipes – by using the slow-cooker and spreading the work out over two days, I really only spent about an hour of hands-on time each day. So, I’m considering my pot-stickers adventure even more successful than that trip back to campus in your mid-twenties: I discovered a fun new ingredient (yuzu), learned a new skill (pleating dumplings), and ended up hosting an impromptu happy hour/play date with our friends and their daughters. It was fun and different – and isn’t that what weekends are for? In a large saucepan, boil wine until reduced by about half. Season beef well with salt and pepper on all sides. Meanwhile, place a large skillet (or your aluminum, stove-safe slow cooker insert) over high heat. Add olive oil and when it is very hot, add short ribs and sear until well browned on all sides. Transfer short ribs to a platter. Reduce heat to medium-high. Add carrots, onions, garlic and thyme. Sauté until lightly browned, about 3 minutes. Add butter and continue to sauté until vegetables are tender, another 1 to 2 minutes. Add brown sugar and tomato paste. Cook, stirring, another 2 to 3 minutes. Put browned short ribs back in the slow cooker insert with the vegetables and sprinkle with flour. Cook, stirring well, until flour is incorporated and beginning to brown (if you are using the skillet, you can just add the flour to the vegetables, then transfer all of that to the slow cooker along with the browned meat. Just be sure to mix well.) Add reduced wine to the slow cooker and bring to a boil. Cover, and cook in the slow cooker on High for 4 to 5 hours, or until the meat is very tender and shreds easily. 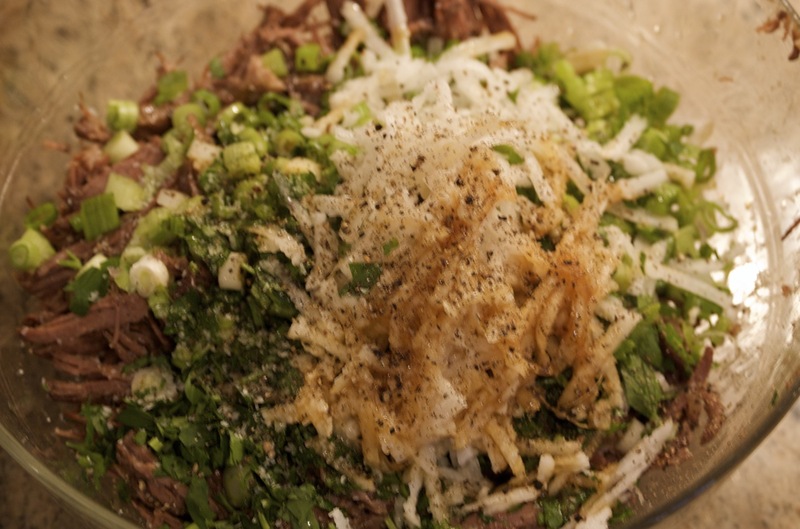 Shred short rib meat into a large mixing bowl, discarding any fat or cartilage. Heat 1 tablespoon vegetable oil in a small skillet over medium heat. Add ginger, garlic and shallots, and sauté until translucent, about 2 minutes. Add to bowl of shredded meat. Add scallions, parsley, daikon, yuzu juice, soy sauce, sesame oil, and salt and pepper to taste. Place a dumpling wrapper on a work surface and spoon one packed tablespoon (or a teaspoon if you’re pleating) of filling in the center, in an oblong shape. Lightly brush edges of wrapper with water, fold in half over meat and press closed, to form a half-moon shape. Stand on end to flatten the bottom. Repeat until all wrappers are used. (Leftover meat can be frozen.) Either freeze on a cookie sheet and then store in plastic bags, or chill until ready to cook the same day. * Part of what attracted me to the recipe was its use of yuzu juice. I’m a citrus enthusiast, and I’d had an unbelievable yuzu sorbet as a palate cleanser at No. 9 Park about a year-and-a-half ago, but hadn’t ever seen it used or mentioned anyplace else. Turns out, it’s not that easy to find if you don’t go online, but I did track it down at a (somewhat) local Korean-Japanese market, and now have two bottles of the uniquely sour stuff. I see sorbet and Asian-inspired cocktails in our future. Anyway, if the rest of the recipe appeals to you, I think lime juice would be adequate. ** The original recipe says this will make 30 dumplings. 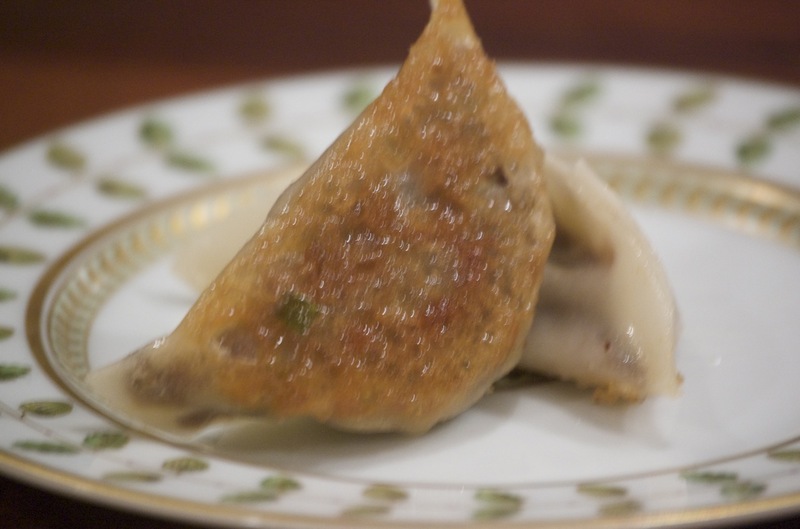 My version made 60, so you might want to pick up two packages of dumpling wrappers.